I have work wife. Usually a work wife comes with a work husband. Ours isn’t so much a lesbian relationship (although we do enjoy a good flirt) as a professional relationship based on deep, mutual respect, understanding and a great deal of enjoyment. At work I am blessed with a group, a crew, a posse so to speak. We even have a catchy nickname and it is a Fight Club situation — no one speaks it aloud. We are three women and two men. I love this group, but the five started as two. Me and my work wife. Work relationships are funny. You can’t be completely honest and open with co-workers at every level. Parity is important. Then there is trust and trust can be challenging professionally. You can’t tell anything to a gossip, or someone with no backbone that will fall to pressure, or a fool who craves validation. Work relationships are all about taking, not so much about giving. Can you make me want to be here for 40+ hours a week? Will you laugh at my jokes? Will you make me indispensable in your life? Will you recognize my personal greatness and figure out how to use me to the best of your professional advantage? Will you let me use you back? Can you make me laugh so hard I spit my coffee? On a really good day, can you make me laugh so hard I pee in my pants? That is work love. I can’t be myself with all women. Aside from my disdain for all things requiring a ref, umpire, or any uniformed official, men get me more than women do. Or maybe I get men more than I get woman. Men know that business is business. It isn’t personal. It is just business and it isn’t emotional. Men understand if you insult me, I’ll insult you back. Then we’ll laugh about it. Men find themselves very interesting conversationally. My work wife and I share these philosophies. Eight years ago we were hired in the same month. The last four years we have been hall mates and a close friendship developed. Two years ago I was promoted to her level and we essentially got married. We work very closely together and I cannot imagine a better, more productive working relationship. We also really like each other. She is my person. One week from today she will move on to a fantastic, new position. It is an incredible opportunity, doing important work in our community. I applaud her and it is a standing ovation. Today was our last lunch, just the two of us, before we move into next week’s endless big group goodbye lunches, breakfasts, etc. After lunch, I sat in my car and I was very… very… sad. I don’t do sad well. I am much better at writing sad characters. Arm’s length is the best proximity to sadness for me. Still my eyes felt, sort of, well, rather leaky. Then it occurred to me how much my blue guest chair will miss her. She usually sits in my blue guest chair as opposed to me in hers, because my office is right by the door. She has sat in that blue guest chair while we plotted business, planned dozens of events, and edited zillions of projects. We worked on my more challenging plot points. We shared and counseled each other through endless family and friend crises and celebrations. Most importantly, we laughed and laughed and laughed. My blue guest chair will be empty much more often now. We’ll get an occasional visitor, but it won’t be the same. 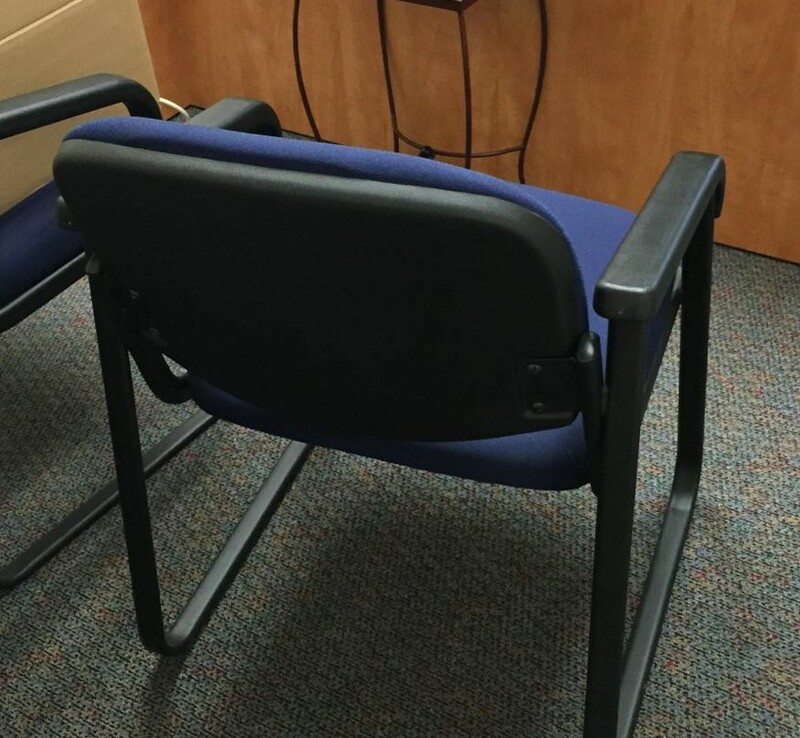 People move on, but my blue guest chair will remain in its exact same spot for many years to come. My blue guest chair will miss her very, very much. Paige, I, too, lost my work wife earlier this year so I can totally relate to your sadness. I knew my wife never intended to stay at my firm for very long, but we nonetheless allowed ourselves to get very wrapped up in each other and even worse, became used to seeing one another five days a week. I was so sad when she left this past April and completely gave up my gym routine, just threw it out the window without her around to also fill the role of gym buddy. We’re also friends outside of the office, so we meet for dinner about once every six weeks or so, but nothing compares to seeing her every Monday through Friday. I’m so, so happy for her and her new (very fabulous) career, but I miss her dearly and don’t think I’ll be getting a new work spouse any time soon. Oh you understand exactly! I am so sorry for your loss. It is terrible break up! Best wishes on you spouseless days. I’ll be thinking of you.